About Carleton Chimney Services Inc.
What is the difference between Carleton Chimney Services Inc. and others? Let’s start with the training. All employees go through an on-the-job training program to first determine their suitability for the type of work that we do. Once we are satisfied that they are a qualified candidate, we send them to the first of many industry training courses offered through Wood Energy Technology Transfer, or WETT. While these courses are not mandatory in our industry, they are the only recognized training courses available and prove to you, our customer, our desire to be the best in chimney services. Is Carleton Chimney Services Inc. satisfied with this certification only? Definitely not. Our staff receives regular updating, and they attend conferences throughout North America. This type of assertive action keeps our people current and ahead of the competition. 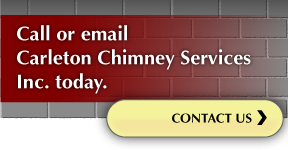 John Carleton started Carleton Chimney Services Inc. in 1979 as a part-time business. A firefighter with the City of North York since 1975, John wanted to do something with his days off and found that the chimney business was well-suited for his abilities. In 1983, he hired his first employee and the company started to grow. In 2001, John retired with the rank of Captain from the Toronto Fire Dept. and now devotes all his time to the business. Today, Carleton Chimney Services Inc. has 12 full-time employees. John Carleton, President of Carleton Chimney Services Inc., feels very strongly about this industry and has been very active in the promotion of the various associations that have been formed to help educate the trade. He is a past Vice President of the Ontario Chimney Sweeps Association, past President of the Association of Registered Wood Energy Technicians of Ontario and he sat on the Board of Governors of the Chimney Safety Association of Canada. He has presented various seminars to the trades, as well as to related industry, such as the Association of Home Inspectors in Ontario, Ontario Fire Marshall’s Office and various insurance professionals.